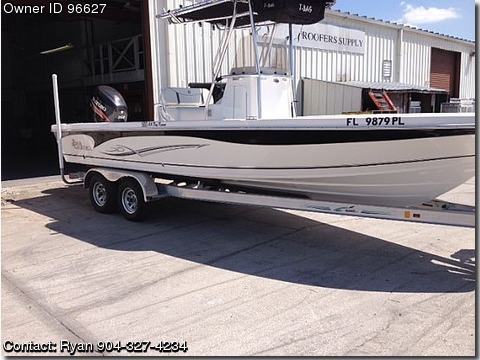 Please contact the owner directly @ 904-327-4234 or rbadia(at)srsicorp.com.Brand New Boat, rigged and ready for the ocean. 10 hrs of use,never been out in the weather. Flawless very dry boat.chart plotter and bottom machine.all coast guard requirments included tandem axle alum trailer never been in the water. purchased all new March 2013 all under warranty lots of extras, must see. garage kept marine radio fm stereo you name it it has it.